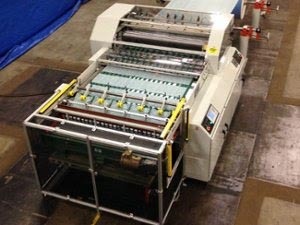 MAXSON AUTOMATIC MACHINERY COMPANY (Westerly RI USA) now offers a sheeter for the cut size and digital format markets that continuously delivers reams from a single discharge point. Designed for the specialty papers and films industries, the MSS Sheeter can convert rolls of material into packs of 25 – 1000 sheet count and offload multiple stacks to a packaging line. +/- 0.015” (+/- 0.38 mm) of the desired setting. In the stacking area, sheets are piled on a conveyor that mounts on a scissors lift load table. When the preset pack count is achieved, interposers extend out over the stacking area as the load table drops to the off load position. The extending grid collects the sheets in the jog boxes while the conveyor feeds the packs to a Customer supplied packaging line. When all the reams are discharged, the table raises back into position and the grid fingers retract until the next set of packs are to be off loaded. Safety interlocked guards and light curtains protect the Operator in the stacking area.